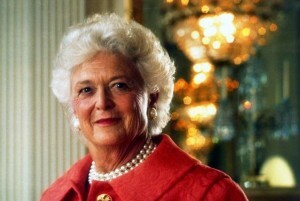 BARBARA BUSH, WIFE OF 41 AND MOTHER OF 43 HAS DIED. Barbara Bush, only the second woman in American history who was the wife and mother of United States Presidents and the only woman in American history to be alive for both Presidencies, has died at the age of 92. We say goodbye to a true original. Barbara and George H.W. Bush were married for 73 years. A spokeswoman says former President George H.W. Bush held the hand of his wife, Barbara Bush, all day and was by her side when she died. Funeral services for Barbara Bush are planned for 11 a.m. Saturday at St. Martin’s Episcopal Church in Houston, which she and former President George H.W. Bush regularly attended. She was an amazing woman. She will be so missed, Rest In Peace. Barbara Bush, the widely admired wife of one president and the fiercely loyal mother of another, died Tuesday evening at her home in Houston. She was 92. Mrs. Bush had been hospitalized with pneumonia in December 2013. She underwent surgery for a perforated ulcer in 2008 and had heart surgery four months later. She was born Barbara Pierce on June 8, 1925, at a maternity hospital in New York City run by the Salvation Army principally for unwed mothers. The family obstetrician practiced there one month a year, and that month happened to be June. She was the third child of the former Pauline Robinson and Marvin Pierce. Her father was in the publishing business and eventually became president of the McCall publishing company. Her mother, the daughter of an Ohio Supreme Court justice, was active in civic affairs in Rye, N.Y., the New York City suburb where the family lived. After graduating in 1942, Mr. Bush enlisted in the Navy and trained as a pilot. The next year, he was assigned to a torpedo squadron in the Pacific and piloted a Grumman Avenger. On one combat mission, in 1944, he was shot down and rescued by a submarine. Barbara did not hear from him for a month. After enrolling at Smith College but before entering the freshman class, she shocked her mother by spending the summer working in a nuts-and-bolts factory. Barbara Pierce Bush delivers the Commencement Address at Wellesley College. Delivered 1 June 1990. Barbara Bush delivered her speech to a less than thrilled audience as the liberal arts all women’s college had wanted another speaker. Little did they realize that she would win them over and give them pearls of wisdom they would use the rest of their lives. Barbara’s comments at the 9:36 mark of the video brought down the house! Former President Jimmy Carter paid tribute to Barbara Bush’s “warmth, generosity and keen wit” following the former first lady’s death. Carter says he and former first lady Rosalynn Carter are saddened by her death and they’ll miss her. Politics really does make strange bed fellows … Or, the enemy of my enemy is my friend. Former Republican presidential candidate Jeb Bush endorses Texas Sen. Ted Cruz. However, is the endorsement too late and will it even matter in the long run? In fact, could it hurt Cruz? Red State opines it could be the kiss of death. What it does show is the continued efforts of the establishment to prevent Donald Trump from being the GOP’s presidential nominee. Jeb Bush has been extremely outspoken about Trump’s “divisiveness and vulgarity.” Is it just possible that the establishment would is warming up to Cruz and would rather have the Texas senator as president as compared to Trump? Many pundits had thought just the opposite as Ted Cruz as been a principled conservative in the US Senate and a thorn in the side of establishment republican politics. In a surprise announcement, Jeb Bush will endorse Ted Cruz on Wednesday as an antidote to the “divisiveness and vulgarity” of Donald Trump, providing a badly needed boost to the Texas senator – but it’s one that comes dangerously late in a game that Trump is dominating. Cruz, in New York City on Wednesday, planned to celebrate with a victory lap of three network morning shows. The endorsement comes 32 days after a beaten Bush dropped out of the GOP presidential race, and eight days since Sen. Marco Rubio abandoned his own quest after being rebuffed by Bush, his fellow Floridian and one-time mentor. “For the sake of our party and country, we must move to overcome the divisiveness and vulgarity Donald Trump has brought into the political arena, or we will certainly lose our chance to defeat the Democratic nominee and reverse President Obama’s failed policies,” the statement continues. The news will surely irk Rubio, who could have benefited greatly from Bush’s embrace. But a Republican source said: “Jeb came to believe Marco was not up to the job of being President. It was never really under serious discussion.” POLITICO reported on Monday that Rubio had rejected the idea of joining a “unity ticket” with Cruz. Bush and Cruz sealed the endorsement agreement with a phone call on Monday. “They have kept in touch over the last few weeks and Senator Cruz has been diligent about keeping Governor Bush up to date on his campaign,” a source close to Bush said. 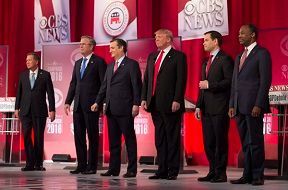 Why on earth are there so many Presidential primary debates? REALLY DONALD, DON’T YOU BRING YOUR FAMILY ON THE CAMPAIGN TRAIL? WHATS THE DIFFERENCE? Hmm, once again GOP presidential front-runner Donald Trump applies a double standard as he mocks other while he does the same thing. Donald Trump mocked his GOP rival Jeb Bush for bringing his brother, former President George W. Bush, to help campaign. Why wouldn’t Jeb bring his bother to a red state like South Carolina? Sorry Donald, its just good marketing, you should appreciate that. In fact, if Donald had a former president as a brother he would be doing the exact same thing. Don’t get me wrong, I am not a Jeb Bush supporter, I believe he represents too much of the “mushy middle” of the Republican establishment, however, let’s call it like it is. Trump has his entire family on the campaign trail all the time. Sorry, the longer this race goes on, the bigger idiot and fool Trump is sounding like. Trump, keep it classy, if that is even possible. Republican presidential candidate Donald Trump is mocking rival Jeb Bush for bringing his brother, former President George W. Bush, to help campaign. “Don’t fall asleep when I mention the name,” Trump said, when he brought up Jeb Bush during a rally in Louisiana on Thursday. Former first lady Barbara Bush recently campaigned with her son in New Hampshire ahead of the primary there. Now, his brother will be hitting the campaign trail in South Carolina to help bolster support. “Especially that last three months, and especially getting us in that quicksand. You know, we got in quicksand,” he said. Trump has in the past called Jeb Bush an embarrassment to his family, which includes two former presidents. 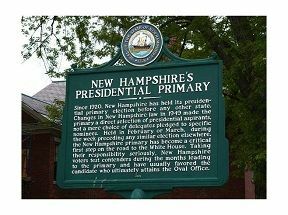 Daily Commentary – Tuesday, February 9, 2016 – So Tonight Is Another Election Primary Night This Time in New Hampshire!